In the middle of one of the busiest seasons of the year at work, I managed to steal away for a peaceful and inspiring long weekend. Last November, when I saw my friend Ashley's photos from outdoor creative retreat for women at Salt Creek, I immediately began dreaming of attending the next time the event came around. 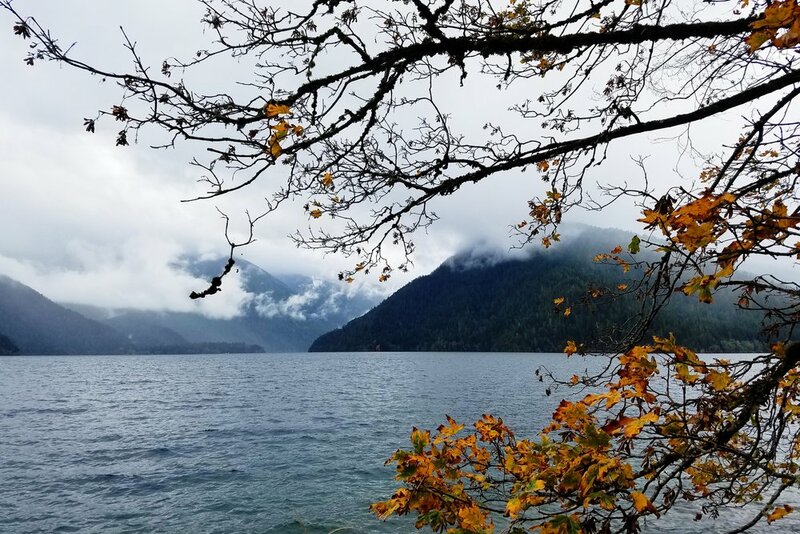 Watercolor and writing workshops by a toasty, crackling fire accompanied by serene views of misty Pacific Northwest coastline? Yes please! However, when tickets went on sale for the 2018 retreat, I suddenly found myself waffling. It would certainly be worthwhile, it wasn't something I needed. Thankfully, Andy intervened and practically demanded that I go. After managing to get through a busy weeks work in just 4 days, I got an early start Friday morning to head for the coast with Ashley. After catching the first ferry, we had plenty of time to enjoy our day before any workshops began at Salt Creek, and after reading all about Pippa’s Real Tea on a mutual friend’s blog, we agreed that our first stop of the day should be Port Townsend. The power may have gone out shortly after we arrived (county-wide apparently!) but that didn’t stop Pippa herself from making us each a delicious cup of tea! Steaming cups of tea in had, we explored a few of the shops that were able to stay open even with the power outage - including a bookshop I’d love to return to when the lights are on - before heading to Crescent Lake for a short hike to Marymere Falls, which I’ll be writing more about soon! I think it’s safe to call the group of adventurous ladies who showed up on a brisk, damp morning are all pluviophiles. For the first time, our book club was joined by the author of our book for the month, and the clouds had descended to accompany author Maria Mudd Ruth on our hike. 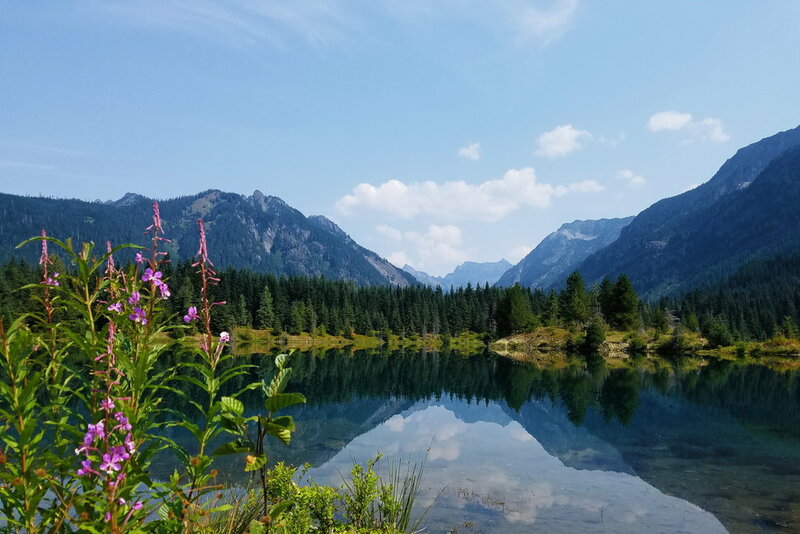 We’d originally planned a longer hike of the Chain Lakes loop, but as our group gathered at the Bagley Lakes trailhead, with icy wind blowing rain at us from every direction, we quickly made the decision to opt for a shorter loop around Bagley Lakes. This was a short but stressful week at work, with Monday off for the Labor Day holiday and Friday off for a short anniversary vacation. Happily, the long weekend more than made up for the stress of the short work week! After much debate, Andy and I decided to spend the weekend at my parents cabin near Snoqualmie Pass. This was definitely a good choice, even if it was made mostly because we’d recently purchased a new mattress, and the old one had been siting in our living room until we could take it up to the cabin to swap it out for one of the horrendously uncomfortable ones there. Since it’s such a short drive, we decided to bring our cat with us, and it didn’t take long for him to get settled in. When I mentioned our plan to my dad, he was dubious, and bringing our cat did turn out to be a bit of a mistake, but only because now I’ll feel terrible any time we go to the cabin without bringing him along! After yet another week of hot temps at home, I was happy for another weekend escape - this time up into the mountains. Friday night after work, I headed east to join my parents at their cabin, and after a short drive I was greeted with a mai tai and a dinner of homemade tamales. Since Sunday was my dad's birthday, I baked my all-time favorite cake for dessert. Growing up, my dad's birthdays were always celebrated at the family cabin, and his birthday cakes - baked in a wood burning oven - always managed to be both burnt and undercooked. This cake, baked with an intentionally jiggly middle, seemed like the perfect homage to the cakes my grandmother baked in that old oven. In place of a birthday candle, my mom lit a match to stick in the cake, and amusing and convenient substitution - perhaps a new cabin birthday tradition?